We are Phil and Chris Banks, both born in South Wales and married for thirty two years. 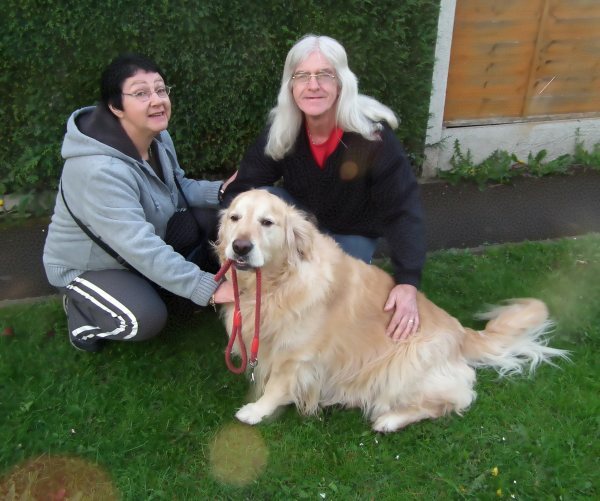 With us is our huge cuddly four year old Golden Retreiver Dylan. We have lived most of our married lives in Monmouth. i am self employed and Chris is envolved with, and does work for the local charities,, Four Paws Animal Rescue and Newstart Cat Rescue. Much of our leisure time, including all holidays are spent viewing animals both at home and abroad. We also assist our near neighbour Peter, in caring for injured and abandoned birds and hedgehogs, rabbits etc.most of which happily are released again into the wild. We do not have a family as unfortunately, we lost our only child more than twenty years ago. It has taken us this long to remotely come to terms with this loss. Now after all this time, as we have found Shanzu Orphanage, the children have become a sort of alternative family for us. Providing what we can for them, and bringing a little joy into their lives is repayment enough for what we do. We are hopeful that upon viewing this site others will contribute what they can to assist us. A huge thank you from Chris, myself, Orphanage Director Christopher Mwawasi and most of all the children of Shanzu Orphanage. Mid summer we are planning a sponsored parachute jump.